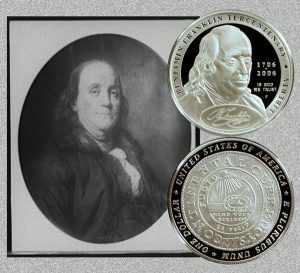 Today, the Franklin Founding Father Commemorative Silver Dollar Coin remembers the solicitation of ships and ordnance from France 241 years ago. Franklin, Deane and Lee to Vergennes. Sir: The Congress, the better to defend their coasts, protect their trade, and drive off the enemy, have instructed us to apply to France for eight ships of the line, completely manned, the expense of which they will undertake to pay. As other princes of Europe are lending or hiring their troops to Britain against America, it is apprehended that France may, if she thinks fit, afford our independent States the same kind of aid, without giving England any first cause of complaint. But if England should on that account declare war, we conceive that by the united force of France, Spain, and America, she will lose all her possessions in the West Indies, much the greatest part of that commerce which has rendered her so opulent, and be reduced to that state of weakness and humiliation which she has, by her perfidy, her insolence, and her cruelty, both in the east and the west, so justly merited. We are also instructed to solicit the court of France for an immediate supply of twenty or thirty thousand muskets and bayonets, and a large quantity of ammunition and brass field pieces, to be sent under convoy. The United States engage for the payment of the arms, artillery, and ammunition, and to defray the expense of the convoy. This application has now become the more necessary, as the private purchase made by Mr. Deane of those articles is rendered ineffectual by an order forbidding their exportation. We also beg it may be particularly considered, that while the English are masters of the American seas, and can, without fear of interruption, transport with such case their army from one part of our extensive coast to another, and we can only meet them by land marches, we may possibly, unless some powerful aid is given us or some strong diversion be made in our favor, be so harassed and be put to such immense distress, as that finally our people will find themselves reduced to the necessity of ending the war by an accommodation. The courts of France and Spain may rely with the fullest confidence that whatever stipulations are made by us in case of granting such aid, will be ratified and punctually fulfilled by the Congress, who are determined to found their future character, with regard to justice and fidelity, on a full and perfect performance of all their present engagements. North America now offers to France and Spain her amity and commerce. She is also ready to guaranty in the firmest manner to those nations all her present possessions in the West Indies, as well as those they shall acquire from the enemy in a war that may be consequential of such assistance as she requests. The interests of the three nations are the same. The opportunity of cementing them and of securing all the advantages of that commerce, which in time will be immense, now presents itself. If neglected, it may never again return; and we cannot help suggesting that a considerable delay may be attended with fatal consequences. Franklin, Deane and Lee to Gerard. We thank M. Gerard for the polite and explicit manner in which he has communicated his majesty’s message. We beg to return our most grateful sense of the gracious intentions which his majesty has had the goodness to signify to our States, and to assure his majesty that we shall ever retain the warmest gratitude for the substantial proofs he has given us of his regard, and that we will endeavor in due time to impress our constituents with the same sentiments. We feel the strength of the reasons his majesty has been pleased to assign for the conduct he means to hold, and the magnanimity of his motives. We beg leave to assure his majesty that we shall at all times and in all things endeavor to conform ourselves to the views he has opened for us, as nothing is further from our intentions than to precipitate his majesty into any measures which his royal wisdom and justice may disapprove. And if in anything we should contravene those purposes, we shall always be happy and ready to amend it according to the advice and direction of government. The Franklin Founding Father Commemorative Silver Dollar Coin shows with a portrait of the gentleman.